We are also offering our clients Ghungroo Without Pads. These are ghungroo pair with extra large bells tied with cotton cords in: 25-25, 50-50, 100-100.We are majorly looking for foreign queries. - Ghungroo pair made in Lonh Lasting brass mounted on colourful Soft cloth/velvet pads/Cotton pads. - Perform Professional classical Indian dance. Owing to our in-depth knowledge in this domain, we are specialized in providing Black Leather Ghungroo Pair. Owing to our expertise in this domain, we manufacture, export, wholesale and supply quality assortment of Ghungroo, Khartal, Gheeka, Manjira. Range of our offered instruments are available in multiple sizes and dimensions as per the recommendations of our customers. Customers can also get these instruments at the affordable prices. Ankle bells fitted in cords. 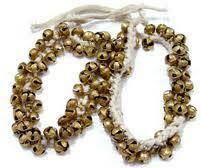 We provide range on pandharpuri Ghungroo in retail and wholesale . 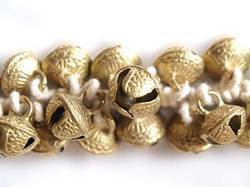 These Ghungroos are used as a necklace to farm cows, buffaloes and also in the releigious activities. Dancing Pad for Kathak kali and Bharatnatyam classical dance, made with finest quality Brass and febric.